We actually met in middle school! Justin, admittedly, always had a crush on me but we never dated because he was a little rowdy for my liking. I moved to North Carolina for law school but would visit home (Berea, KY) frequently. On one of those trips we reconnected, had dinner, and went bowling as friends. I went back to school and we’d talk here and there. When I moved home we started hanging out as friends quite a bit. Slowly, our friendship blossomed into a wonderful relationship, and now marriage. We really wanted our wedding to be unique to us and personalized as much as possible. We also wanted our ceremony to show the love we had for each other and for our families, friends, and the Lord. We surprised our parents with parent’s vows and also requested that they do a laying on of hands to pray for our marriage. We also wanted our reception to be family-oriented and provided guests with alternatives to dancing. We had personalized coloring books for the kids, personalized corn hole boards for those that didn’t want to dance, glow sticks, and lots of different cake flavors. We wanted it to be fun for everyone! 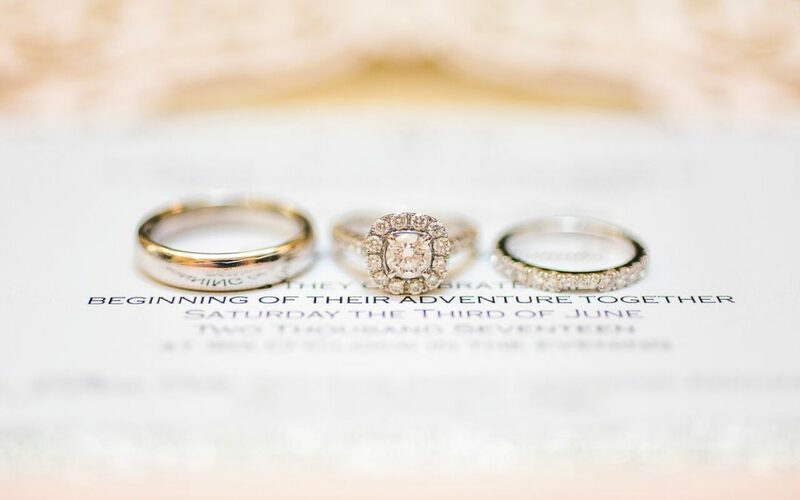 How did you choose your groom’s wedding band? My grandparents (Oogie and Darlene) would have been married 58 years this year. However, my grandmother passed away at the beginning of 2015 from breast cancer. At the time of her passing, my grandfather hadn’t taken the ring off in 55 years! Their love story was truly one-of-a-kind. My grandfather continued wearing the ring almost two years after my grandmother’s death and only took it off to give to Justin. He said that my and Justin’s love reminded him of his and Darlene’s love. My grandmother had engraved in my grandfather’s ring ‘My love is yours today, tomorrow and forever.’ It was barely legible when Justin received it. When we got it sized, we had the same engraving put back in to honor my grandparents and to honor our love to each other, ‘My love is yours today, tomorrow and forever’. My grandfather also spoke at the wedding about the ring! Something we will always cherish. Tell us about your guest favors! We donated to specific causes and organizations in lieu of party favors. The donations were either in memory or in honor of very important people in our lives. We donated to The Alzheimer’s Association, Brain Aneurysm Foundation, National Hospice Foundation, and To Write Love on Her Arms. Enjoy the moment. Enjoy planning and don’t get too stressed out because at the end of the day, what’s most important is that you and your future husband will be married. At the same time, personalize, personalize, personalize your wedding and stay true to what you want. I’d also recommend getting as much done before the big day so you can enjoy it and not run around worrying! Get pictures done before the reception so you can enjoy and mingle with the guests who have shared your big day with you! To see more of Amber and Justin’s wedding, make sure to pick up a copy of Volume 3!